My personal favorite I've found from Marshal's folios. Alexander Marshal, who lived from 1620-1682, was a wealthy Londoner who moved in circles of Horticulturists. At this time, hundreds of species that had never before been seen in England were being introduced there for the first time from the "Near East" and the "New World." His major life's work, The Florilegium of Alexander Marshal, documents many of these exciting species, but it is important to note that this undertaking was for pleasure, not for science. William Freind, Marshal's nephew, attested that Marshal had "an independent fortune and paint[ed] merely for his amusement." 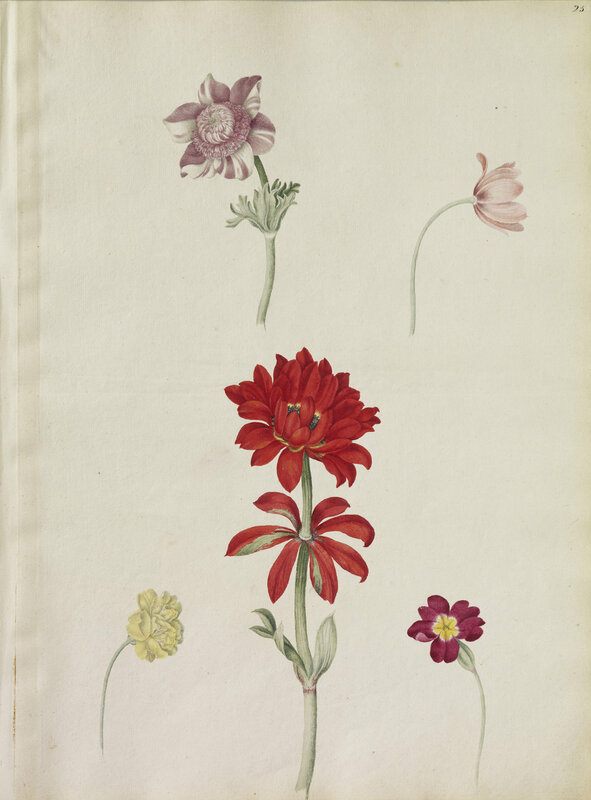 The work contains 159 folios of over 600 different plants and has belonged to the Royal Collection since the time of King George IV. A Double Gold Lilly, a White Double May-weed and a Meadow Blue-Bell. Many times what I am astounded with when I admire artists and craftsmanship of the past is the sheer amount of work that was produced and the incredible number of hours it would have taken to do so. In Marshal's case, he did not have to concern himself with making money, so his prolific output can be partly attributed to luxury. However, it is still astonishing, especially considering that he only lived to be 62 and that all of these paintings were created 400 years ago from live observation—there was no assistance of the camera, and no existing imagery that Marshal would have been familiar with to reference. It should also be said that no matter how advantageous the circumstances, it is an extraordinary body of work. A double purple ringed Daffodil, three varieties of striped Tulip and a double Jonquil flower. A great double orange tawny Anemone, a purple striped Anemone, a single pink Anemone and a double yellow and a bright red Primrose. 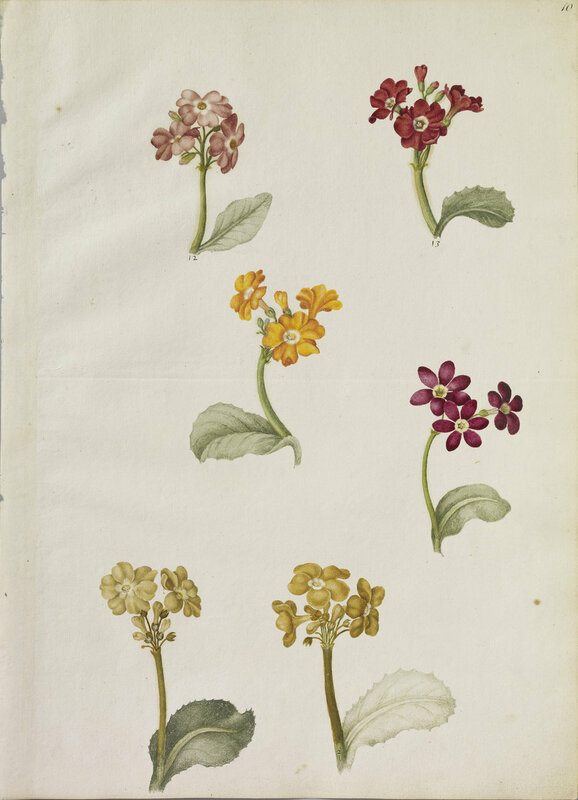 A Pancratium illyricum, a Hyacinthus (Brimeura) amethystinus and two Primula x pubescens, all with leaves and flowers. Two sprigs of Rose of Province. Something that charms me about Marshal's botanical illustrations in particular is their sketchbook-like compositions and the intermittent inclusion of quirkily out-of-scale renderings of animals. A striped Tulip, a sprig of Honeysuckle, a yellow poppy and also a Minor Fish (pasted on). 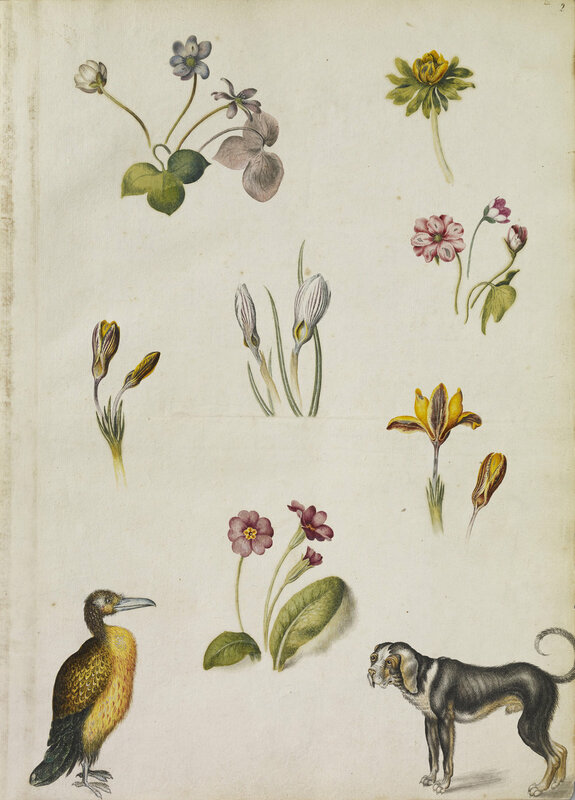 Winter aconite, Liverwort, twin-flowered crocus, crocus from Susa in Western Iran, Common Primrose, a dog and a bird. Blue and yellow macaws, southern hawker, wasp, unidentified bird, caterpillar and chrysalis of swallowtail butterfly, crayfish, greyhounds, cylcamen leaf, and oak eggar caterpillar. 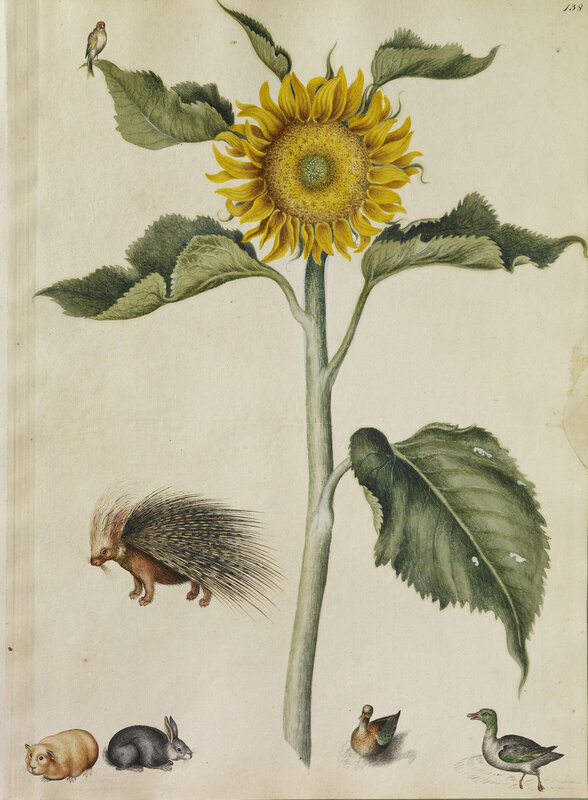 Marshal's Florilegium is the only remaining example of such a book from the 17th century. I feel so grateful to have access to it. 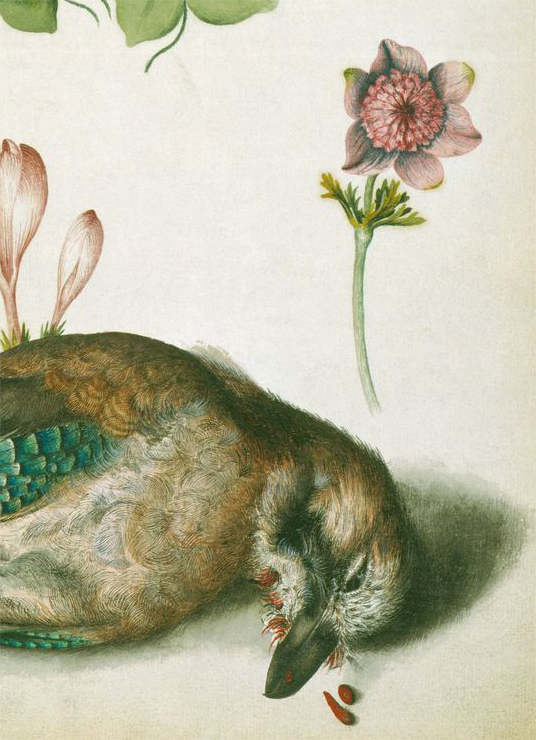 If you are an artist or appreciate fine technique, I highly encourage that you peruse the Royal Collection's website, as each illustration is captured in extraordinary detail. A detail I captured from The Royal Collection's downloadable file of one of Marshal's Rose of Province paintings.